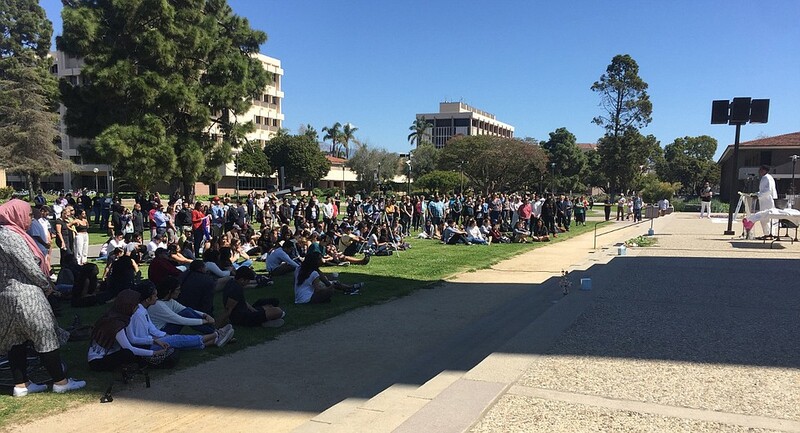 Photo: Blanca Garcia Several hundred people gathered at UCSB to mourn the people killed in a terror attack on a New Zealand mosque. About 250 people gathered at Storke Tower at the University of California, Santa Barbara on Monday to commemorate the lives of the 51 victims of the New Zealand terror attack. The crowd, unlike others that have gathered at the central plaza, drew more than just students, with community members, professors, vice chancellors, and Chancellor Henry Yang also in attendance. The event was organized by the UCSB Muslim Student Association. They organized a number of speakers and placed flowers, and boxes of tissues, on the plaza steps. The attack on a mosque in Christchurch, New Zealand, took place the afternoon of March 15 during Friday prayer. At UCSB’s event, senior Romy Rabie read the names of the 51 individuals who were killed. Dozens of other people had been wounded. The youngest of the victims was 3-year-old Mucaad Ibrahim and the eldest 71-year-old Haji Daoud Nabi. The gunman had stated President Trump’s rhetoric was inspiration for his white nationalist ideology. A vigil was also held at the Santa Barbara Courthouse on Sunday, KEYT reported, attended by about 100 people and elected officials, including Rep. Salud Carbajal. It was organized by the Blessed Tree Foundation, founded by Imam Yama Niazi, who formerly led the Islamic Society of Santa Barbara.